level. You will learn how to assess risks for yourself, and make effective route finding decisions. - Planning a day using off-piste guidebooks, maps, and the avalanche forecast. place to hire from. Mention Avalanche Academy for a discount when hiring. Did both the foundation and avalanche progression course with Stuart both were very well run in a professional and informative matter and of course lots of fun. Would recommend these courses to anyone who has an interest in off piste and back country snow sports. This review applies to the Sun 02 Feb 2020 - Chamonix version. Last weekend I took the Foundation and Progression courses, which were both fantastic. Both days were packed with information, practical skills, and great powder turns. Stuart was an excellent instructor, guide, and fun guy to ski with. I would highly recommend Avalanche Academy to anybody who is even thinking about chasing the powder off piste. This review applies to the Sun 12 Jan 2020 - Chx touring version. This review applies to the Sun 16 Feb 2020 - Chamonix version. I'd done the Foundation course the day before, so was curious as to what the Progression would teach us. Our snow & environment awareness got cranked up yet another level... Analysis of terrain, planning your routes, looking at slopes which had already avalanched and working out why... plus of course some excellent skiing to get to interesting places. This is an excellent complement to the Foundation course. I would also consider doing this as a refresher course next year. Thanks for an epic weekend ! I got absolutely everything I wanted from it, and then some.Thanks again. We got a lot out of the course. I already knew a lot of the information, but didn't know how to use it to plan a day off-piste. Ground and terrain selection is critical, so today was very much what I was looking for.Please pass on our thanks to Tim for his excellent teaching. Stuart utilised all moments to talk about avalanche awareness, including on all the lifts and during lunch. As a group we were constantly analysing the snow pack and weather and trying to make informed decisions about where to ski. We packed so much into the day including some great skiing. The whole day was enjoyable, informative and well worth the money. 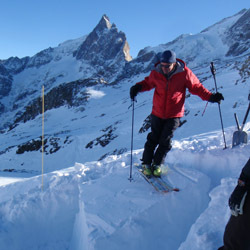 Tim delivered a superb Avalanche Progression course on Monday. The scenarios were very realistic and thanks to his excellent plannning we got some great skiing too ! I've done a fair amount of avalanche training in the past and was treating the progression course as a refresher. This was probably the best training day I've had with a guide. Stuart has put real thought into how to pack a lot of information into a short space of time and, critically how to apply it and make decisions on the hill. I'm sure, were I to do the course again, I'd come away with something new. I'm pretty sure I'll be back.